Students from Dr. Jill Lipoti and Mary Nucci’s environmental studies practicum formed a team to investigate microplastics in the Raritan. They studied the technique used by the NY/NJ Baykeeper to gather samples to count microplastics utilizing a Manta sampling net. Noting that the cost of the Manta net could be prohibitive, they invented a simplified apparatus for sample collection. They listed the raw materials, made a budget, and went to “Maker’s Space” on Livingston campus to construct the simple sample rig. The students then gathered on the R/V Rutgers to try out their sampling equipment alongside the Manta net. The goals of the project were: 1) to add additional sample results to Raritan water quality data, and 2) to provide data for justification of various strategies to decrease the plastic burden in NJ watersheds. Students were excited to be on the Raritan aboard the R/V Rutgers learning from Sandra Meola (NY/NJ Baykeeper), Dr. Beth Ravit and Dr. Carrie Ferraro (both of Rutgers). They also assisted in taking water quality measurements using a YSI ProDSS, the same equipment used by the NJ Department of Environmental Protection in their water quality sampling. Students discussed policy initiatives to decrease microplastics in the Raritan River basin. Dr. Kristi MacDonald shared the activities of the Raritan Headwaters Association. One student had already established a student organization, “Ban the Bag”, as a policy initiative to eliminate one source of microplastics in the ocean. She proudly talked about her success in motivating other students to recognize the threat. Students used the sample rig they had made to collect microplastics. The first rig broke because it could not stand up to the strain of the water streaming through the net. Luckily, they had constructed a back-up. The students deployed the second rig for a more limited time, with a slower boat speed. It was successful. This simplified sampling rig could now be used by citizen scientists to raise awareness of the prevalence of microplastics. These students produced a poster about their work and exhibited it at RU Sustainable. 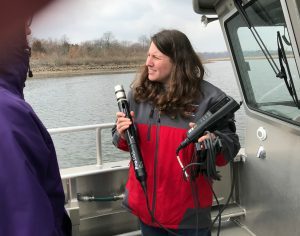 They also brainstormed a number of ideas with Sara Malone and Carrie Ferraro (with the Rutger Raritan River Consortium) to better connect Rutgers students with the Raritan River. Some of their ideas may be undertaken by subsequent classes of students as projects in the Practicum or as service learning opportunities. It would be gratifying to realize one student’s vision of a bench on a high bluff overlooking the Raritan where students could take a break from studying and absorb the peace and serenity of the river. It would be exciting to see natural graffiti painted with moss paint that points the way to the Raritan and helps students build connectedness to their natural environment through art. This effort was partially support by the R3C Mini-grant program to support research and student engagement on Raritan River, basin and bay resources issues. You can find more information about the mini-grants here. 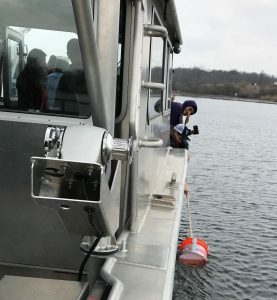 Photos of students deploying simplified sample rig on the R/V Rutgers, and Dr. Carrie Ferraro demonstrating YSI ProDSS by Mary Nucci.